Although the three men take different roads to the buzkashi field, Buzkashi charts the sport as a sort of continuity in a landlocked nation that has undergone considerable change in recent years. The sport seems like a common link between the men as they hold onto tradition each time the grab the limp legs of the goat and carry it to victory. The game lives on even though Tajikistan undergoes considerable cultural and political shifts, which Mirza notes by providing some backstory on the players and on the country’s civil war. He also follows some of the players’ peers and family members to show currents of change in Tajikistan, such as one storyline with Azam’s son, who dreams of becoming a doctor thanks to his interest in the new science programs introduced in the school. Change also rolls through the sport of buzkashi itself, as some of the players switch sides on how to play the game. Buzkashi is traditionally a sport in which the individual rises above the melee of the crowd and uses his strength to provide riches and rewards for his family. Some players like Khurshed, however, see the advantage of turning buzkashi into a team sport, thus working together with the strength of numbers even though one player ultimately carries the goat over the goal line alone. The corruption of the buzkashi echoes the sentiments that some of the players express on the changes in society more broadly. 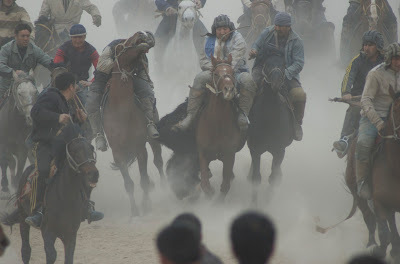 Buzkashi never comes off as a barbaric sport even though it involves tenderizing a little goat for a goal. 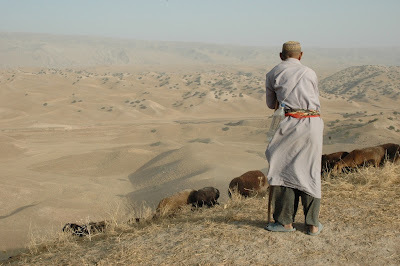 Mirza carefully selects footage that explains the game to viewers well enough; moreover, the views expressed by the players note the cultural importance of buzkashi: the community, the tradition, and the culture. The preparations for the game also show that the goat is killed before it’s thrown onto the field, and that a goat is not used in practices, but is instead substituted with a bag of similar weight. 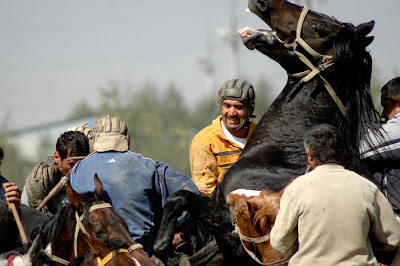 Buzkashi, however, acknowledges that the practices of the sport and the culture may seem alien to western audiences, which is highlighted especially well in one of Khurshed’s interviews in which he chuckles that the folks at Greenpeace will put an end to goat goals if the sport ever catches on in the west. Buzkashi ultimately embraces the roughness of the sport and portrays the game in some stunningly shot sequences that capture both the chaos and the excitement inspired by the sport. The goat-tossing is set against the visually striking backdrop of the snowy Tajikistani landscape, as well as some traditional music that strikes a few notes of Atom Egoyan flair into this Canadian production. Buzkashi might not inspire too many new players to the sport, but it’s sure to intrigue many viewers with a glimpse into a world they’ve never seen before. Buzkashi screens in Ottawa tonight at The ByTowne at 9:20.